These pictures were taken on 8 October, 2005 in Frickenhausen, near Stuttgart. They show an extraordinarily dense ensemble of memorials, arranged chronologically (probably by chance) from the back to the front of the north side of the Protestant "Our Lady" church on the square across from city hall. 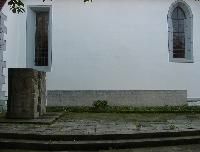 At the back of the church stands a tall linden tree with a small plaque in front of it. 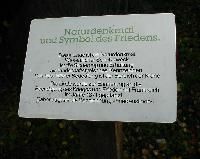 The plaque - obviously of much more recent origin than the event it refers to - reads, Nature Monument and Symbol of Peace / This linden tree is a protected natural monument. Primary purpose is securing and maintaining it as typical for the landscape. The top of the tree is of particular importance. 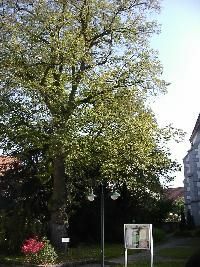 / This linden tree was planted in 1871 in memory of the end of the war and peace with France. That is why it is called the "Peace Linden". 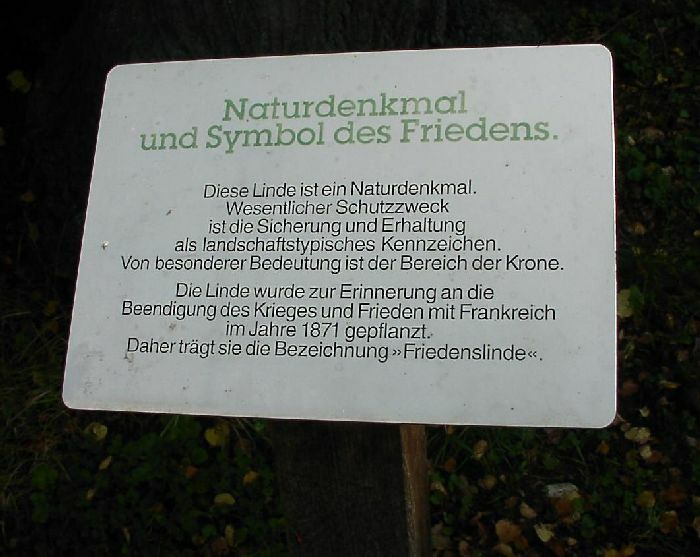 Perhaps I am too cynical, but I strongly suspect that the tree was originally a "Siegeslinde" - "Victory Linden" and was only later, after the Second World War, re-interpreted. But I am sending an e-mail to the local pastor. Maybe he can tell me more. 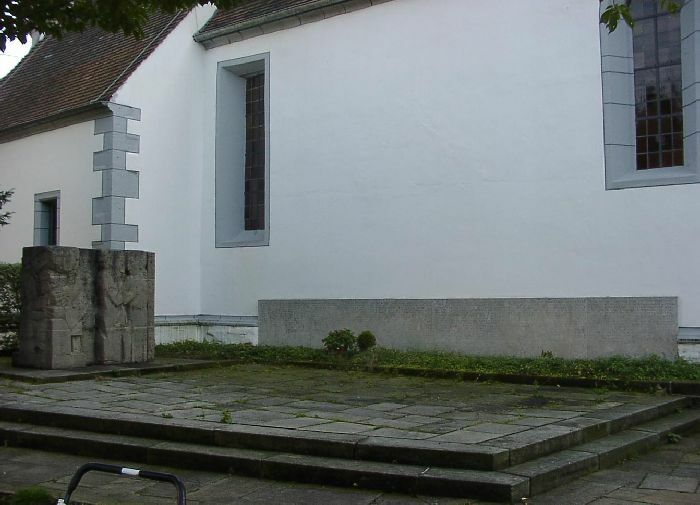 To the right of the linden, along the north side of the church, there is this low patio with a standing memorial stone and a long stone plaque along the wall of the church itself. I do not have a better picture of the front of the stone. It seems to show an abstract rendering of two pairs of human figures embracing. The back of the stone - invisible unless the visitor goes out of his or her way to walk around behind it - it reads, I want to comfort you as a mother comforts one. The stone does not say so, but that is a quote from Isaiah 66:13. 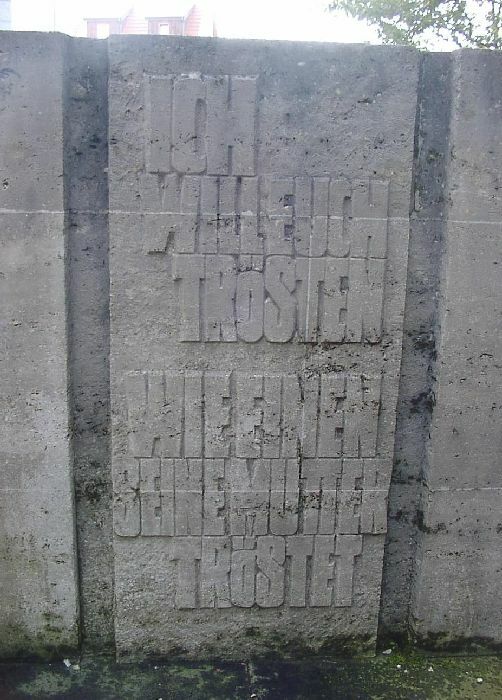 The stone is true to the Luther translation (1545) and I have rendered that here in English. But the original verse in Luther's version is longer. It reads, ja, ihr sollt an Jerusalem ergoezt werden, according to the King James translation of that passage: As one whom his mother comforteth, so will I comfort you; and ye shall be comforted in Jerusalem. 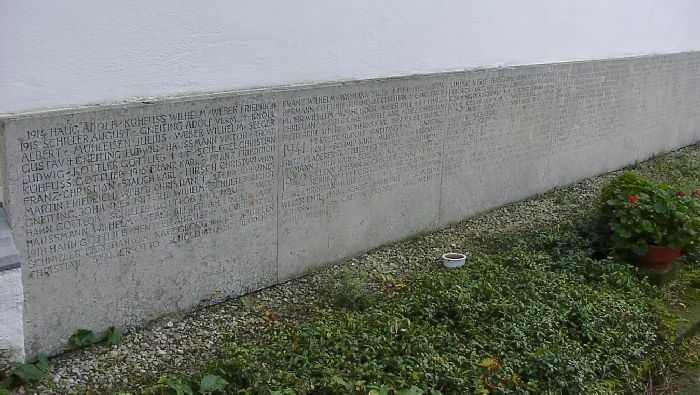 The wall has the names of all the fallen from both World Wars. 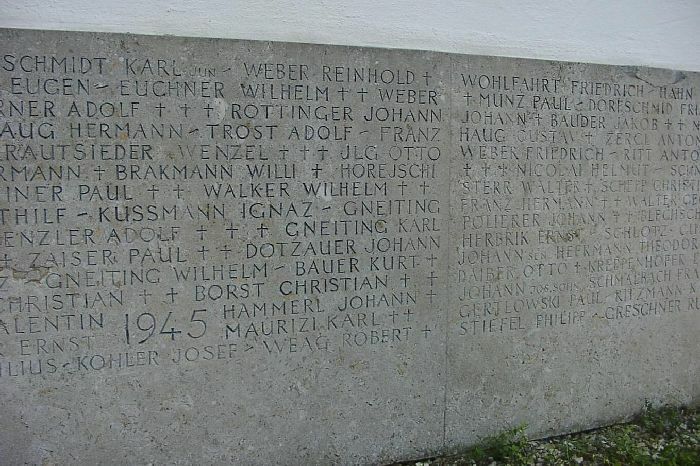 As on so many memorials,1945 has the most names. Several of the names were followed by the words, son of Jos. (short for Joseph) or some other name in smaller letters. I am not sure what that means. 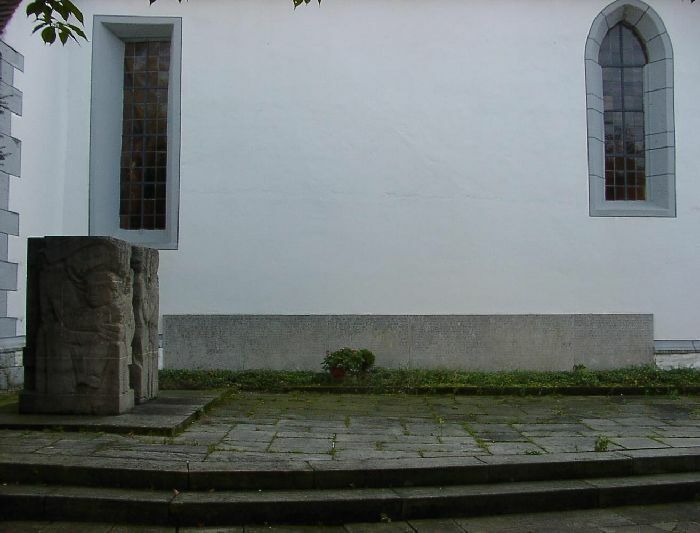 On the far right, along the path leading into the main entryway at the front of the church, is this memorial to the expulsion of the Germans out of the eastern parts of Germany which were annexed by the USSR and Poland. Millions of Germans had to flee and were scattered throughout the rest of Germany. 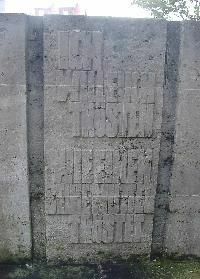 It is reasonable to assume that this congregation took in a large number of them and later put up this memorial. 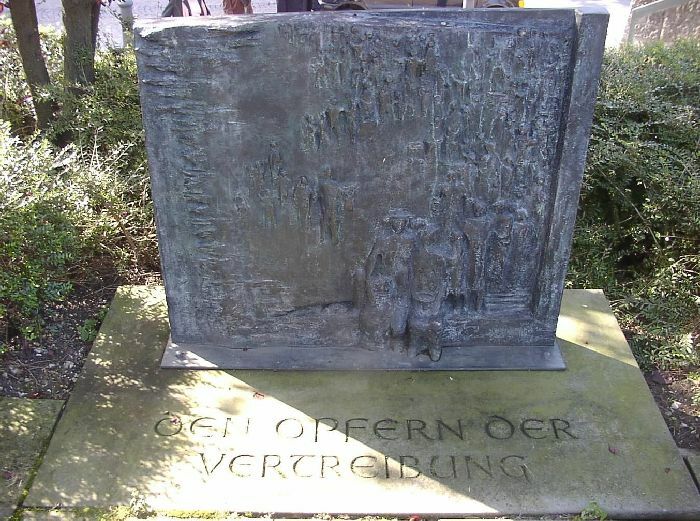 It shows abstract renderings of crowds of people and reads simply, For the victims of the expulsion. I talked to several older members of the congregation, but nobody could tell me exactly when the various memorials were installed. One recalled, "the early fifties".